With his UnitedHealthcare team's future in doubt, Mannion rallies to win Colorado classic, poising himself for a step up in 2019. An individual time trial is supposed to hurt, and one performed at 9,000 feet of elevation is guaranteed to sting a rider’s legs and lungs. When Gavin Mannion pedaled up Vail Pass during stage 2 of the Colorado Classic this past August, the pain blended with a feeling of redemption. With each pedal stroke, Mannion, 27, erased the frustration of his disappointing ride at the previous week’s Larry H. Miller Tour of Utah, the altitude-friendly race where he was supposed to star. And each pedal stroke brought Mannion closer to the career-defining victory that had eluded him for years. More than two months after that time trial effort — which led to his overall victory in Colorado — Gavin Mannion still remembers scenes from the race. Two days after that effort, Mannion secured the overall after a bitter fight to defend his lead. The victory gave Mannion and his UnitedHealthcare teammates an important boost of positivity after a year of worry and despair. UHC is set to fold at the end of 2018 after more than a decade of operation, and the Colorado race was the squad’s final American stage race together. Staff and teammates were desperate for a result to boost morale before the offseason. And Mannion’s victory served as a confidence booster for his future. Next season he heads to Rally Pro Cycling, and will likely earn a chance to race in North America and overseas. The opportunity represents a bridge to cycling’s big leagues which Mannion has wanted since his days on the Trek-Livestrong development squad. In short, the Colorado Classic was the perfect way to close out his season ahead of a big transition. Preparation, patience, teamwork, and a bit of strange luck all played into that performance. Mannion’s 2018 campaign got off to a strong start. He snatched a stage victory and second overall at the Tour of the Gila, and finished 11th at the Amgen Tour of California, the second-highest domestic rider behind wunderkind Brandon McNulty (Rally). Mannion headed into the second half of the year confident in his chances for the two major objectives on the docket: the Larry H. Miller Tour of Utah and the Colorado Classic. To prepare for the high-altitude races, Mannion scheduled a personal training camp in the ski town of Breckenridge, where the soaring climbs top out well above 10,000 feet. He drove to nearby Vail to preview the opening two stages of the Colorado Classic. Mannion then went back to his home in Fort Collins, to put in long, climbing miles along the familiar road up Rist Canyon. The final preparation of his block was in Park City, Utah. Mannion felt extremely fit in the weeks prior to the Tour of Utah. It was a huge target for not only Mannion, but also his UnitedHealthcare team, at the time still holding out hope that a new sponsor could be found to keep the team alive after 2018. Utah did not go as planned — Mannion battled respiratory problems throughout the weeklong race. He believes that the wildfires sweeping the state may have had an impact on his lungs. While UnitedHealthcare put in a strong showing in the Utah sprints with Travis McCabe, Mannion ended the race in 31st place overall, far below where a climber like him should have finished. Still, there were signs that Mannion had strong legs. “I felt really good on Nebo [in stage 2] and that was probably one of the better climbs I’ve ever done, so I knew that there was some fitness there and that I hadn’t totally screwed things up for the second half of the year,” he says. Mannion had other reasons to have a positive outlook coming out of Utah. During the Utah race, Mannion made a verbal deal with management at Rally Cycling to race with the team in 2019. As other riders headed into Colorado worrying about the job market, Mannion was secure. The GC battle at the Colorado Classic was destined to hinge on the 15.88km individual time trial, which gains 1,574 feet in the final few kilometers. Mannion believes he won the race during the race’s slightly downhill opening section. Riders often smash themselves too early, and then hit the base of the climb gasping for air. Not Mannion. “I think the first half is when I really won the time trial, just riding really steady pacing, riding right on that limit of saving enough for when the roads went steeper,” he says. Mannion saved his legs for the steepest pitches. When he rolled across the line, he heard he had delivered the fastest time up to that point. Nonetheless, there were still a few riders yet to arrive at the finish. Mannion’s teammate Serghei Tvetcov was one of them. Tvetcov came close to knocking Mannion out of the hot seat but was 11 seconds shy of his time. The stage win, and the race lead, belonged to Mannion. That said, stage 3 brought challenges of its own. Some 50 kilometers into the day, the first-category Lookout Mountain climb saw EF Education First-Drapac hit the front at a torrid pace. Then came a flurry of attacks from the likes of Hugh Carthy and Joe Dombrowski. Mannion couldn’t keep the pace. As he started going backward, a dangerous move went clear. “Pretty much the eight or nine strongest guys in the race got away on the climb,” Mannion says. Fortunately, the race didn’t end on the top of Lookout Mountain. Mannion’s UnitedHealthcare teammate Alex Cataford helped pull him back into the chase group, and then more teammates began to mass at the front of the peloton. As they wound up the chase, the gap to the escapees stabilized and then began to fall. Other teams began to chip in as the break became visible in the distance. As the final kilometers loomed, the danger had passed. With a sprint stage on tap for the final day of racing in Colorado, the GC was more or less secured. “For Colorado, I think I won the time trial, but then my teammates won the race on that road stage,” Mannion says of the UnitedHealthcare team’s hard work to bring things back in stage 3. It was the kind of performance that wasn’t a guarantee considering the dire straits that faced the squad and its many un-signed riders this summer. 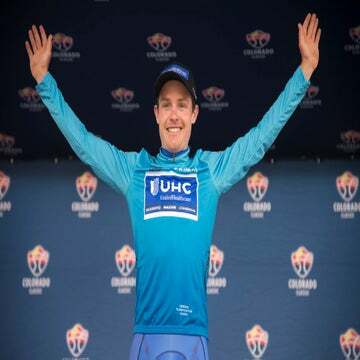 In staying safe and upright on the final day of the Colorado Classic, Mannion wrapped up his first ever GC victory at the UCI 2.HC level (just one tier shy of a UCI WorldTour rating). A week after struggling through the final stages of a disappointing Tour of Utah, he found himself in the “surreal” position of taking the biggest win of his career, one that will be a critical building block as he heads into the offseason. Mannion may have already had his 2019 with Rally sorted before the start of the Colorado Classic, but now he can ride into the offseason focused on what’s important. 2019 should see Mannion spending time racing in Europe as Rally looks to grow its footprint there further every season. At first, Mannion expects to ride mostly in support of teammates like Brandon McNulty. He expects a “steep learning curve” and stiff competition against the European Pro Continental squads and the WorldTour outfits sure to be in attendance at those races. Then, Mannion is hoping to get some chances to ride for himself again in the big American races again in 2019. The season should present plenty of challenges across the board. Mannion has an offseason to get ready for the year to come — and with a big Colorado win now on his palmares, he can focus on what’s important over the next few months.